Let's (Cautiously) Celebrate the "New Eugenics"
It's a subject doctors, health providers and medical experts are discussing feverishly, but often quietly: whether parents should undergo genetic tests, either before conception or after, to determine if their unborn child might have a serious genetic disorder. Hanging over the debate is the specter of eugenics--fears that the ability to manipulate the health of our future babies could devalue the sanctity of life. 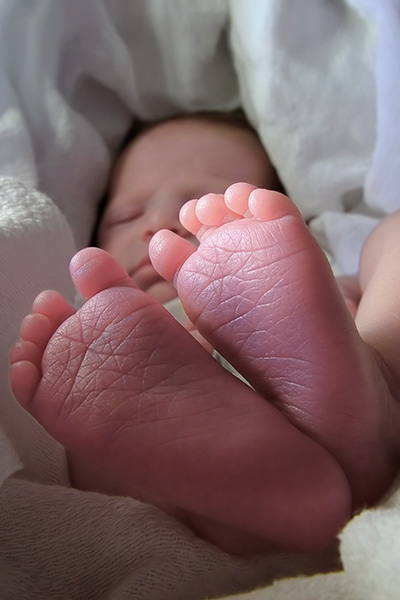 About three percent of babies in the United States are born with a major structural or genetic birth defect. It's a bracing occurrence for a family and a multi-billion hit to our already strained medical system. So it's fair to ask whether preemptive genetic screening makes sense, medically and ethically. Ronald Bailey at Reason wrote an article recently on the birth of a genetic screening company, GenePeeks, which when matched with its sister company Matchright helps women using in vitro services virtually evaluate donor sperm that has been screened for Mendelian defects (diseases caused by single gene mutations). It's the brainchild of Princeton geneticist Lee Silver and the Harvard Business School professor Anne Morriss. Morriss was spurred in part by her own experience. She and her wife bought sperm from a reputable sperm bank to father their child. Alec was born with medium chain acyl-CoA dehydrogenase (MCAD) deficiency, a rare (1 in 17,000) genetic disorder that blocks him from converting certain fats into energy, leading to seizures and death in many cases. A genetic test later discovered that the donor carried the rare recessive gene that led to the disorder. Would the couple have had Alec if they had know that he would be born with a potentially life-crippling defect? That might be the wrong question to ask. If the GenePeeks-Matchright service had been up and running, Morriss and her wife would have chosen a different donor. The service is a twist on genetic screening tests that have soared in popularity in recent years. The leading company in the budding field, California-based Counsyl, offers prospective parents an opportunity to buy through their doctor or clinic a one-price panel of tests for more than hundred genetic diseases, including cystic fibrosis, Tay-Sachs, spinal muscular atrophy (SMA), sickle cell disease, and Pompe disease. The screen costs a few hundred dollars and is often provided free through insurance and state health programs, which are poised to save millions of dollars in future medical bills if the tests can prevent children with severe disabilities from being conceived. That's where the ethical rub comes in. Although programs offered by Counsyl and presumably by GenePeeks have stirred little opposition among religious groups--indeed one of the advantages is that the potential for a damaging mutation can be identified before conception--the very idea of breeding the 'perfect baby' remains highly controversial. Just last year, two prominent, thoughtful people, Lloyd Lewis and Julie Reiskin, officers with the Colorado Cross Disability Coalition (CCDC), wrote an article in the Denver Post decrying the proliferation of inexpensive genetic screening tests that can often determine whether a fetus has a genetic disorder--in other words, after conception. Many couples now choose to have their fetus aborted when a severe disorder is identified and the pregnancy is not far along. Lewis and Reiskin likened the practice to infanticide. We now have researchers with the scientific know-how working with Wall Street-backed corporations to develop the new weapon in the struggle to rid the world of people with developmental disabilities: a "non-invasive prenatal test (NIPT)" that can detect a "disability" or "genetic disorder" anywhere from the fifth to ninth week of pregnancy without amniocentesis. One of the first "disorders" targeted by NIPT technologies is Down syndrome (DS). Although this test is sometimes promoted for "women at risk" for having children with DS, often the long-term goal of this technology is universal testing. To be blunt, this test will likely result in a rapidly decreasing population of people with DS. As parents of DS children and as activists in the disability rights movement, their pain is understandable. But that does not make their desire to ban or heavily restrict this technology persuasive or wise. Abortion is a prickly issue, contentious and personal, entangled with legal and moral standards that vary from community to community. Lewis and Reiskin advance a moral argument as a backdoor way to promote changes in the legal landscape, and I believe they do so disingenuously. If successful, their efforts would lead to curtailments in abortion rights and limits on genetic health screens. Almost all communities in the United States, Europe and most other Western countries allow for the termination of pregnancies when the mother is found to be carrying a fetus with a genetic disease. The raw truth is that prospective parents would prefer having children with no genetic defects. There is already broad national support for screening fetuses to determine whether they contain genetic abnormalities: amniocentesis. It involves inserting a needle through the uterus to withdraw fluid and fetal cells from the amniotic sac. As the opinion piece noted, 80 to 90 percent of women who receive a positive amniocentesis test for DS choose to terminate their pregnancy. Although controversial in its early days, it's now a broadly accepted procedure that ultimately results in the termination of tens of thousands of pregnancies every year. But amniocentesis is an invasive test; some women refuse to ask for it for that reason alone. The CCDC's opposition to genetic screening is based on its belief that because genetic screening is a non-invasive technique (and now booming in popularity), it will result in even more terminations. "To be blunt, this test will likely result in a rapidly decreasing population of people with DS," write Lewis and Reiskin. That's almost certainly accurate. The CCDC is a responsible organization that promotes the rights of the disabled. Most of the people linked to CCDC have or are associated with children with one form of genetic disability or another, often DS. They have a compelling, deeply personal moral argument that's not unlike the one promoted by anti-abortion groups--terminating human life in any form and at any stage of development is wrong. The CCDC however takes no position on abortion--which means in effect it voices no concerns about terminating healthy pregnancies, but wants to establish unique moral and legal rights for fetuses with genetic defects. Lewis, Reiskin and the CCDC have the right to advance any policy position. Their engagement is part of how democratic societies have chosen to work through this moral thicket. But positions should be based on sound science and reasoning, not on appeals to emotion and hyperbole. Adolf Hitler's embrace of eugenics would discredit the movement, but unfortunately it didn't disappear... Today, in fact, we see the rise of a new eugenics, made possible by the rapid development of bioscience and biotechnology, especially from the mapping of the human genome. This is obviously technology and philosophy that the American eugenicists in the 1920s would have embraced, along with their counterparts in Nazi Germany. It's an all-too-common distortion of the social history of genetics policy in the United States. 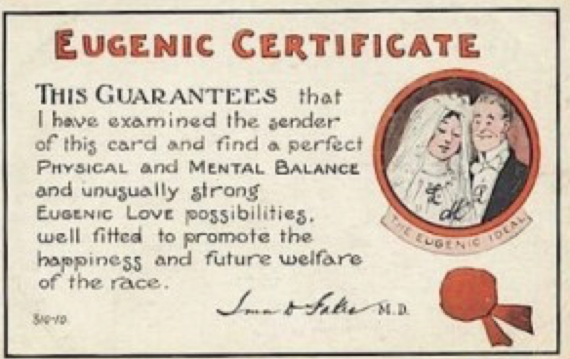 Eugenics is typically portrayed as morally repugnant by today's standards. But eugenics (meaning simply "good genes") has its roots in the progressive era at the turn of the twentieth century, not in Hitler's twisted Final Solution. The scientists who formulated these ideas were very much mainstream, and their proposition sounded reasonable to an American and European establishment trying to come to terms with waves of ill-educated immigrants from Southeastern Europe. 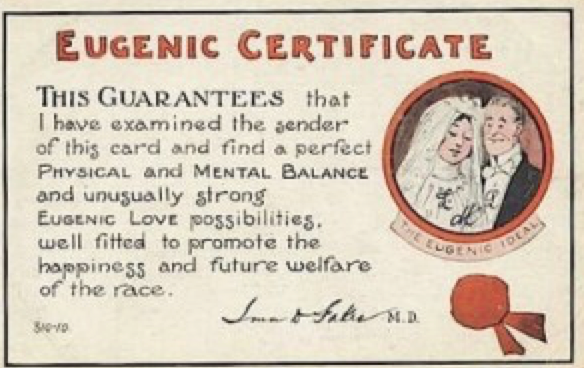 Scientists offered what they considered to be a progressive solution: "positive eugenics," which focused on better pre-natal and natal and health care and encouraged society's healthiest citizens to have more children. The founder of Planned Parenthood, Margaret Sanger, along with many major Protestant and Jewish clergy, were eager proponents of positive eugenics. The "negative" wing of eugenics, feverishly popular in the teens and twenties, even among some progressives, wanted to legally prevent the mentally ill, poor, immigrants and non-whites from having children. Some Social Darwinists also propagated the belief that progress could only be attained by phasing out "undesirable genes." We practice mild versions of this today--that's what amniocentesis accomplishes. By the 1930s ideologues of the far right twisted eugenics to justify Nazism and genocide. Their exploitation of the practices led to the now widely accepted view that the "eugenics movement" as a whole was intrinsically evil and inhumane, which even today casts a shadow over the modern focus on improving individual and societal genetic health in a non-coercive way. The eugenic impulse drives us to eliminate disease, to live longer and healthier, with greater intelligence and a better adjustment to the conditions of society. It arises whenever the humanitarian desire for happiness and social betterment combines with an emphasis on heredity as the essence of human nature. It is the aim of control, the denial of fatalism, the rejection of chance. The dream of engineering ourselves, of reducing suffering now and forever. We are in the "second age of eugenics" Discover blogger Razib Khan has written, citing the growth in the number of terminated DS pregnancies. Because of advances in genetic screening, we are in a position to reduce the prevalence of many Mendelian diseases (e.g. sickle-cell anemia, cystic fibrosis, PKU, Huntington's disease). We are now able to identify mutation carriers before conception so diseased embryos are almost never conceived and abortion is never a question. And yes, that would mean fewer babies born with Down syndrome. The growing influence of the "new eugenics" has put both the far left and right on edge. They share a quasi-religious belief that nature and life should be considered inalterable. Pro-life groups and activist groups on the left that argue for the dignity of people with disabilities often campaign vigorously against aborting fetuses known to carry debilitating diseases. Their case has been taken up by activist writer Alex Knapp who holds that no one is "eugenically unfit" and society has advanced too far scientifically and morally to allow such practices. He focuses solely on negative eugenics and not the positive impact that family planning and genetic screening have already had on society. His focus on negative eugenics is rampant on the hard-edged ideological left, promoted most vociferously by the Center for Genetics and Society, which considers itself a progressive advocacy group but is actually the opposite on many genetics issues. 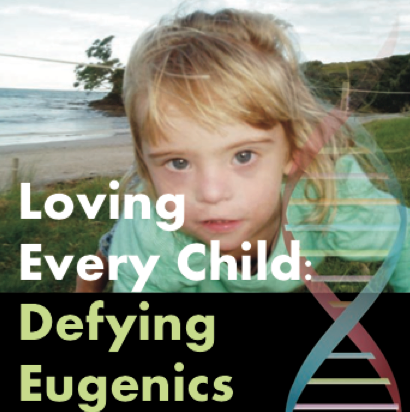 It often conflates prenatal testing and gene therapy with negative eugenics, arguing that it is socially and ethically reprehensible to alter the genes that we pass on to our children. It's an odd argument given that CGS supports planned parenting--positive eugenics--which attempts to achieve the same goal as preventative screening but with far less precision and more unintended consequences. Their fear stems as much from the tool itself (genetic technology) than its intended consequences. The Gattaca argument: more "fi" than "sci"? 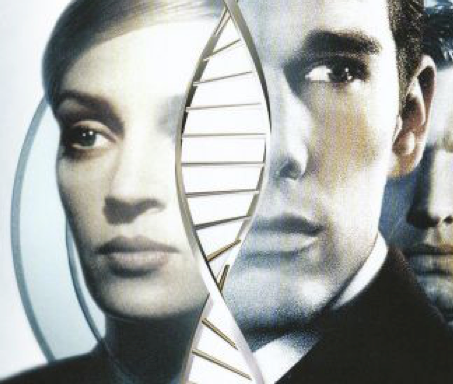 In the grand scheme, the biggest bugaboo haunting personal genomics is the specter of Gattaca: as more people adopt genetic screening, the choice to use it could become less voluntary--or at least harder to turn down. Science 2.0 founder Hank Campbell argued that once it becomes possible to engineer "superior" qualities in human beings, then a parent's only moral choice would be to have genetically superior children. That's the ominous theme behind the Lewis and Reikin's concerns. It may sound like a real argument but it's sci-fi in the extreme. The CCDC, Knapp, CGS and Campbell may believe they are warning against Big Brother but their positions would seem to encourage Big Brother-like restrictions. "There's no doubt that we need to consider the difficult ethical questions that arise as our ability to manipulate nature improves... But making ominous predictions and restricting personal choice shouldn't be a part of that discussion, at least not without evidence." Modern eugenic aspirations are not about the draconian top-down measures promoted by the Nazis and their ilk. Instead of being driven by a desire to "improve" the species, new eugenics is driven by our personal desire to be as healthy, intelligent and fit as possible--and for the opportunity of our children to be so as well. And that's not something that should be restricted lightly.